Living in such wild affluence as we do in the USA, it’s hard to imagine the world norms. More than 700 million people are in extreme poverty, trying to live on less than $2 a day. I don’t want to romanticize poverty — but I was struck by this humble home and wanted to share it with you. Moving out of “extreme poverty” and into just “poverty” comes with a concrete floor, electricity, water, an efficient fireplace, and a little dignity. Take a look. I’m here with my crew, filming an upcoming special called “Ethiopia, Guatemala, Hunger, and Hope.” It will air this November on public television across the US. Stay tuned for more. What is travel as a political act? Join me in the highlands of Guatemala at about 10,000 feet above sea level for some thin-air thoughts about what Guatemala and Bolivia have in common. Is it just a coincidence that the most indigenous countries in our hemisphere are also at some of the highest altitudes — and among the poorest? I’m kicking off my 2019 travels with the first of 100 posts from the road. Right now, we’re in Guatemala, filming an upcoming special called “Ethiopia, Guatemala, Hunger, and Hope.” And this little clip celebrates how farmers who used to do subsistence farming, just growing corn in an attempt to feed their families, are now diversifying for the global market. These sugar peas are destined for London, and these farmers are destined to do some banking. I’ll be posting almost daily now for the next four months or so, as I travel from Guatemala to Ethiopia to Italy, Switzerland, Ireland, and more. So, be sure to let your traveling friends know — because we’re in for some great travels, and everyone’s invited. I’m in Guatemala, filming a new one-hour public television special about world hunger — and learning about extreme poverty and smart development. On Friday, the news broke that President Trump plans to cut development and humanitarian assistance to three Central American countries, including Guatemala. This news has been heartbreaking and, frankly, baffling. If your motivation is to slow migration from Central America to the US, then development, jobs, and hope are the best medicine — and US aid is a great investment. Here in Guatemala, I’ve been studying exactly that. Aid is not only desperately needed here, but also, quite simply, smart. The people I’ve met here love their country. They want to work hard and export the fruits of their labor. If they made the treacherous trip to the US, it would only be out of desperation. 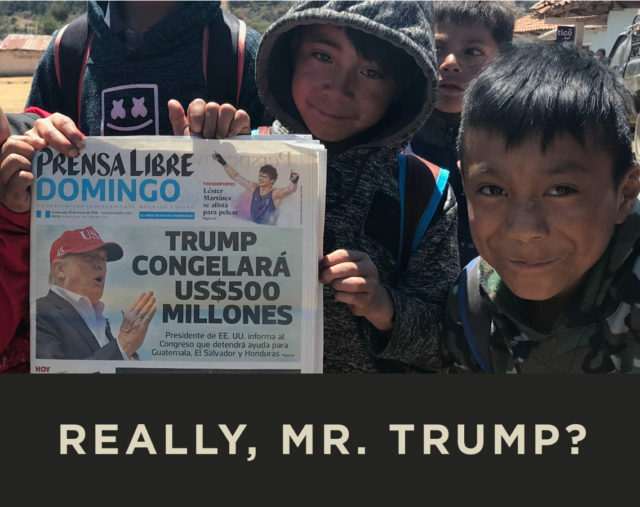 Cutting US aid to Central America will slow development, and the result will be more refugees at our border…not fewer. If you’re worried about our southern border, smart aid is a smart investment. I spend four months of every year in Europe, notebook in hand, lovingly researching and updating my guidebooks. But with more than 70 books on the market with my name on them, I can’t do it all alone. I’m grateful for the help of a trusted team of co-authors and researchers — many of them old friends — who travel in the Rick Steves style and are dedicated to making our guidebooks the best in print. Join me in this clip as I meet with my wonderful Rick Steves Ireland co-author, Pat O’Connor. Pat came by my office to propose a new self-guided walk through the south side of Dublin, beginning at St. Stephen’s Green and heading past Trinity College, Dublin Castle, and Christ Church Cathedral, and then down Temple Bar to the O’Connell Bridge. I’ll be in Dublin myself this July, and I’m excited to test out this new material, explore Pat’s latest discoveries, and make some discoveries of my own. I’ll be sure to tell you all about it once I’m there — and, of course, you’ll find it all in the 2020 edition of Rick Steves Ireland.